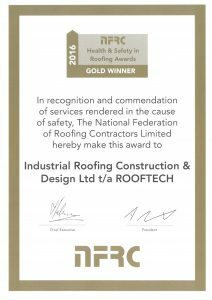 ROOFTECH are committed to developing a positive pro-active health and safety culture. ROOFTECH implement health and safety management based upon a risk assessed approach to job tasks, which in turn are supported by controlled methodical systems of work that are designed to eliminate or minimise risk. ROOFTECH can now take on the responsibility of Planning Coordinator during a CDM notifiable project. This duty is undertaken by our own Health & Safety Advisor who’s responsibility is to ensure the correct procedures are followed and giving ROOFTECH the ability to undertake the role of a principle contractor.